Although not at Frimley Lodge Parkrun as for the second time in three weeks the venue was out of action. Still with so many local venues on our doorstep this has encouraged the FL regulars to sample other courses. 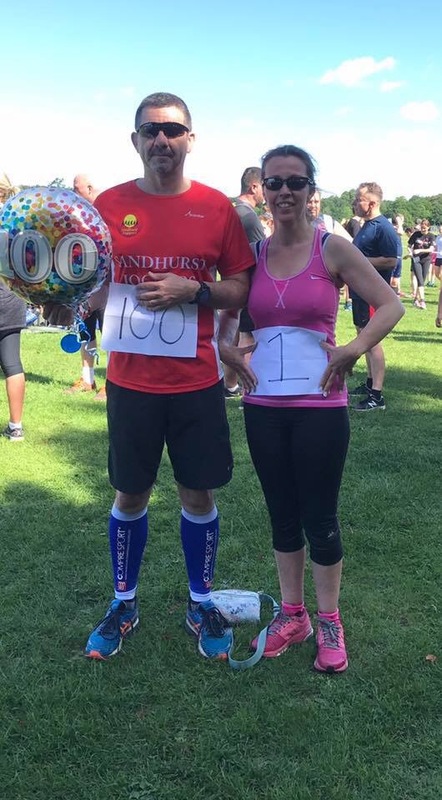 It was landmark time at Rushmoor as Nigel Evans completed his 100th Parkrun with a large group of friends and family. You may remember Nigel’s romantic London Marathon experience as he proposed to partner Liz. You’ll be pleased to know the wedding is still on track with Liz completing her very first Parkrun this weekend. Mark Pattrick was first SJ to finish in 20:50 which is his best time in 2017. Martin Sharrod and Tina Acock recorded their best times at Rushmoor. Over at Bracknell Neil Praine led home the SJs with a Bracknell course (both old and new) best of 20:59. Thirteen members took part with John Tzanetis running his first Parkrun in over a year to come close to his Bracknell best with 26:49 and Mr Consistent Colin Carpenter again honed in on his 30:00 PB, this week only missing by four seconds. 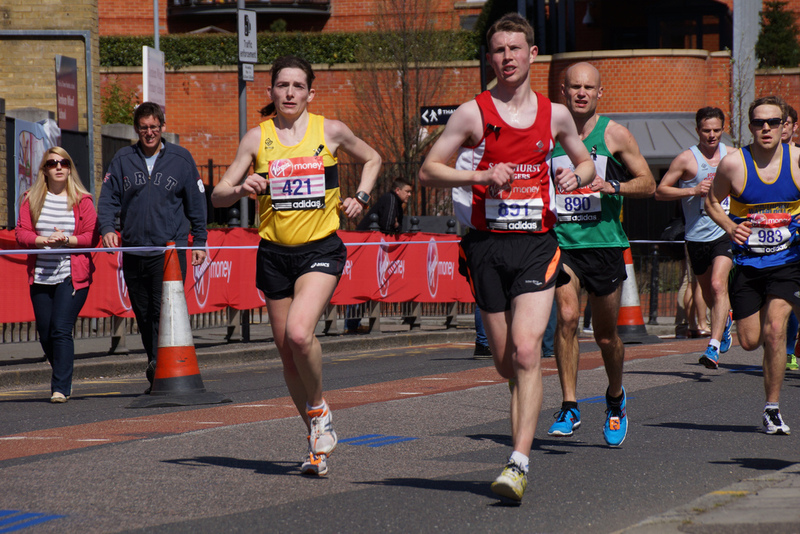 Run of the day came from Blanche Barnes who logged a Bracknell PB of 34:38. Four members ran at Woodley with Patrick Wadsworth first to finish for the club in 22:03 which is his best on the Woodley course. Next home was Vicky Rice also logging a course PB and a fastest ever Parkrun in 24:00 showing that she is clearly in great form heading into the ETU European Middle Distance Triathlon Championship in Denmark next weekend. You can add Sandhurst Joggers to your Parkrun profile and this really helps us to keep track of your results and your tourism. If you are not sure how to do this, just message me and I’ll help. Diverse tourism this week with Stuart Overhill joining 1241 other runners at Bushy Park Parkrun, Anne and Simon Whillis at Reading, Richard Boese at Black Park, Yvette Glacken in action at home venue Luton, John King in Telford and Will Lucas in Seaton. Many of you will have been following Leon Hicks’ remarkable endurance journey with a mixture of disbelief and awe but this week’s endevours have blown us away as he completed four marathons in eight days. Last week we told you about the Saturday Night Marathon. Leon followed this up with the ‘Indy Run’ a Phoenix running event along the Thames on Thursday night then onto a weekend double in Deal, Kent starting with the Viking Coastal Marathon on Saturday and the Reculver Marathon on Sunday to celebrate his birthday! Lisa Hale was the 9th female to finish ‘The Hurt’ a trail race organised by AAT Events. She finished the tough 21k course which included 652 metres of climbing on the South face of Holmbury Hill in the Surrey Hills in 2:09:05. Jacqueline Hudson, Julie Graham and Holly Dunn completed the Striding for Survival event in the grounds of Virginia Water; a 10k event to support Pancreatic Cancer Awareness. The trio ran superbly finishing as first, second and third women on the day. Up in Richmond Park; Angela Foker completed the inaugural London 10 Mile event. Tackling the distance for the first time she finished in a great time of 1:49:52. Over in Stockholm Carl Bradshaw completed the Stockholm marathon in 5:26:53. Over in Northern Ireland Iain McCready ran the Walled City Marathon in Londonderry. Following a challenging course that ran along the meandering banks of the River Foyle, crossing twice on the city’s famous bridges and finishing in the historic Guildhall Square, Iain completed the 26.2 miles in 4:09:58. Any surprise on who tops the Strava leaderboard this week? With his triple header of marathons Leon Hicks takes the title with a huge total of 126km! Jim Laidlaw grabbed 2nd with 69.5km and Lisa Hale third this week with 66.0km. Sixty-two members logged runs this week. To take part in this just create a free Strava account and link it to the club in your profile. Monday: Patrick will be leading the usual Monday night chatfest leaving Sandhurst Sports Centre at 7:30pm. Tuesday: This week the Tuesday Runs will start from The Morgan Rec in Crowthorne at 6:30pm. Later the interval sessions will meet at The TYTHINGS in Yateley at 8pm where we will be using the field – 13 x 2 minutes. Thursday: This week the threshold/improvers run will be on the superb local trails. Thursday runners are still getting familiar with the summer routes but soon a regular route schedule will be established. Nikki will provide the details along with her unique perspective on the world of running later in the week. Friday: Track is still free and the THREE coaches have some great sessions planned for all abilities to improve fitness and technique. Saturday: Lots of teams at the Endure 24 event at Wasing Park near Aldermaston ready for 24 hours of running festivities.